Disadvantaged Business Enterprise (DBE) Program is a required federal program administered by MoDOT’s External Civil Rights Division. Projects with federal funding will normally contain a DBE goal that is set to assist in achieving a statewide goal. This article guides the Resident Engineer’s office in administration of the DBE Program on the project level. For any questions or additional information regarding this article, contact MoDOT’s External Civil Rights Division. DBE compliance consists of ensuring that the prime contracts utilize DBEs as indicated in the contract. Each contract has a contract goal and during the bidding process the prime contractor identifies the DBE vendors that it will use to achieve the project goal. These vendors will be a combination of subcontractors working on the project, suppliers, brokers and trucking companies. The prime contractor and MoDOT should ensure that the DBE vendors used to achieve the goal are performing a Commercially Useful Function (CUF). The Resident Engineer should check the subcontract requests Form C-220 for DBE subcontracts against the DBE Identification Submittal in the contract. The check should include a contract item by contract item review to confirm the line item bids vs. the actual commitment. As with any subcontract item when the prime contractor indicates a partial unit price for a subcontract item, it shall be accompanied with justification for the partial price. An example may be items of work in which a prime is doing some of the work while the subcontractor is performing the remaining work. Justification of partial subcontracts is especially important with DBE work to monitor whether the DBE will be performing the work required. The level of justification may vary depending on the item but may include an actual copy of the subcontract between the prime contractor and DBE subcontractor. Refer to EPG 105.9.17 Subcontract Approval Request. If there are overruns on the project for items a DBE could perform, the prime contractor will attempt to utilize additional DBE participation on the project. If underruns occur on a project for line items a DBE was scheduled to perform, the prime contractor will attempt to seek other DBE opportunities to achieve the DBE goal on the project. Commercially Useful Function (CUF) basically consists of checking that the DBE vendor performs the work, supplies the material, has its own labor, and controls its work. The Resident Engineer office should conduct periodic checks to verify that the DBE vendors are performing a CUF. The verification for CUF varies depending on the capacity the DBE vendor is being used. The following describes what constitutes a check for CUF for various DBE uses. For DBE vendors performing work onsite, the CUF check consists of basic verification that the DBE vendor employs the workers, controls the work, purchases the materials and owns or leases their equipment. The MoDOT Disadvantaged Business Enterprise (DBE) Job-Site Review - Commercially Useful Function (CUF) Determination form provides the standard questions to perform a CUF for an onsite DBE. Questions on this form will also require that the engineer check payroll information to ensure that the DBE contractor employees are independent of the prime or other non-DBE contractors on the project. In accordance with 49 CFR Part 26.55 (c), expenditures to a DBE contractor may only count toward DBE goals if the DBE is performing a CUF on that contract. The engineer shall conduct at least one CUF interview using the form for each DBE vendor on the contract, regardless of Part B status. Additional interviews should occur if the engineer notices a change in the DBE vendor or prime contractors operations. Materials manufactured by DBE firms can be counted for DBE participation at the rate of 100% of the materials. DBE suppliers can be counted for DBE participation at the rate of 60% of the value of the material that they supply for the project. DBE brokers act as intermediaries generally for material supply as well and can be counted for participation at the rate of their brokerage fees. The External Civil Rights (ECR) Division will ensure through the firms certification process that the DBE supplier and/or broker conducts their service in accordance with the federal DBE regulations (49 CFR Part 26.55 (e)) regarding CUF. The engineer should report any activities that could indicate that supply has come from a source other than the DBE supplier or that materials are being delivered by someone other than the DBE Company. The prime contractor shall routinely supply verification that DBE suppliers are being used as indicated in the original participation. This may include copies of paid invoices, receipt of material certifications from the DBE supplier and/or communication between the DBE supplier and other contractors or the engineer’s office regarding material supply. If there is a request for the use of two-party checks, refer the contractor to the External Civil Rights Division for the required approval. The engineer shall conduct at least one CUF interview using the form for each DBE vendor on the contract. Additional interviews should occur if the engineer notices a change in the DBE vendor or prime contractors operations. Manufacturers and suppliers must be listed in the Missouri Regional Certification Committee (MRCC) database. The DBE Manufacturer/Supplier CUF Certification Process has been established to streamline the CUF review process for off-site DBE firms which supply materials on multiple projects, often concurrently, on a regular basis. The process allows more efficiency by eliminating the requirement of one CUF review to be performed per contract for DBE manufacturers and suppliers, and instead, certifies firms for a 30-day period based on satisfactory completion of a single CUF review. CUF reviews performed on 30-day intervals or as needed, based on materials manufactured or supplied, will then serve as the required CUF review and verification per Federal requirements. An initial CUF review will be performed by the inspecting district This CUF review will cover all aspects of the DBE firm’s processes. The CUF review will cover all material shipped by the DBE firm to any project for a 30-day period from the date performed. Subsequent CUF reviews will be conducted at 30-day intervals, if the DBE supplier has material that is delivered within that time frame. The inspecting district of a DBE manufacturer or supplier will be responsible for performing CUF reviews at the required frequency. As part of the CUF manufacture / supplier review, the engineer completes a CUF form carefully verifying of all aspects of the DBE manufacturer or supplier’s process including manufacturing, handling and shipping, as applicable. The CUF form should be filled out with all pertinent information except for the Contract ID, Job No. and Prime Contractor fields, which are to be left blank. Completed CUF forms shall be filed in the Construction and Materials Division’s external SharePoint site. The file shall use standard file naming convention outlined in EPG 150.1.2 File Naming Convention. When a DBE manufacturer or supplier sends materials to a MoDOT project, the engineer shall verify the DBE firm and the shipping date. With this information, the engineer should go to the Construction and Materials Division’s External SharePoint site and select the CUF report that represents the manufacturer or supplier in the date range for the subject materials delivered. The engineer shall add the Contract ID, Job No. and Prime Contractor and save a copy of the completed CUF form to the pertinent contract folder in the Contract Information Archive folder on the V: Drive. DBE trucking companies are commonly used for participation on projects. 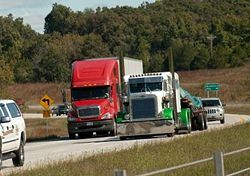 Since DBE trucking companies generally are not submitted as a subcontractor, much like suppliers and brokers, the engineer must take steps to ensure that the trucking firms are being utilized in a CUF manner. The engineer should note in the diary when DBE trucking firms are being utilized on the project with sufficient detail to verify that the trucking firm conducts the work indicated in the DBE Identification Submittal in the contract. To assist with this verification, the CUF Determination form should be used as well. The engineer shall conduct at least one Trucker Interview per each DBE trucking company on the project. Additional interviews should occur if the engineer notices a change in the DBE vendor or prime contractors operations. This page was last modified on 22 February 2018, at 12:57.